Element Seabed from Baie Slings is 100% combed cotton and 255 GSM, making it a medium weight wrap. It's woven using Baie's Double Weave. Baie Slings is a British company born of a family of babywearing artists. Based in picturesque west Wales, they create beautiful patterns out of natural materials while supporting local businesses. As if their stunning slings weren't enough to challenge your PayPal balance, the very talented Juliette has now established Oak Wren Studio making gorgeous capes and cloaks to order from your favourite wraps. Baie use a variety of weave structures for their wraps. Their Plush Weave is a looser weave, which makes for airy, very mouldable, cushy wraps, whereas their Snug Weave is a slightly tighter weave making for a sleeker, smoother look. Baie explain that Snug Weave wraps have less grip, but are still soft and mouldable with evident cush. They also use a classic Herringbone weave, an Advancing Twill Weave called 'Andante', an exciting Advancing Twill / Plush Hybrid Weave that we've seen used with their Twertles design, and the Twill / Plush Hybrid Weave used on their Twill Waves. Baie's Double Weave is the only one of their weave structures to use two wefts and has already been used by Baie in a handful of wraps. I've been lucky enough to try Baie's Plush Weave in both 100% cotton and a hemp blend (see my reviews for Oak & Holly King and Trowen Goldspun). Both were lovely so I was extremely excited to have the opportunity to test their double weft Double Weave and find out all about its wrapping qualities. Seabed is woven on Baie's subtly graduated, five-stripe, blue to black warp. It has a gold weft and a turquoise blue weft, which work perfectly with the warp. The extra weft in the Double Weave facilitates a dazzlingly beautiful complexity of colour and the Element design showcases this perfectly, making excellent use of the additional shades. The result is a euphony of rich colours. ...My meditative state was interrupted slightly by my two year old loudly emptying the Duplo out of its basket in order to free up his 'boat' for sailing on Seabed, which had been draped on the floor along with the octopus bath toy. Suffice to say, you don't have to be into sub-aqua to appreciate the marine qualities of Seabed and, if you choose to purchase this stunner, you won't be in need of a seaside play mat! In loom state, Seabed felt a bit flat and slightly crispy. Don't let this put you off though as the transformation post-wash is huge! One wash and tumble dry softened it up significantly and really brought out the texture of the pattern into three dimensional sharp relief. It feels fairly light and true to its 255 GSM weight. Seabed is floppy and soft from that first wash. Not quite as soft as their Plush Weave cotton, but I imagine it'll get there fairly quickly. When wrapping, the passes eased into place without fuss but the weave and pattern provide excellent grip. It stayed put perfectly in both a FWCC TUB (Front Wrap Cross Carry Tied Under Bum) and DH (Double Hammock) TUB with my squish and toddler respectively, tied off with only a half knot. Baie's Double Weave is a tighter weave, which can sometimes make for a less mouldable wrap, but that couldn't be further from the truth with Seabed. The Double Weave incorporates some kind of pixie magic giving the wrap a special multi-way stretch, making Seabed beautifully mouldable. 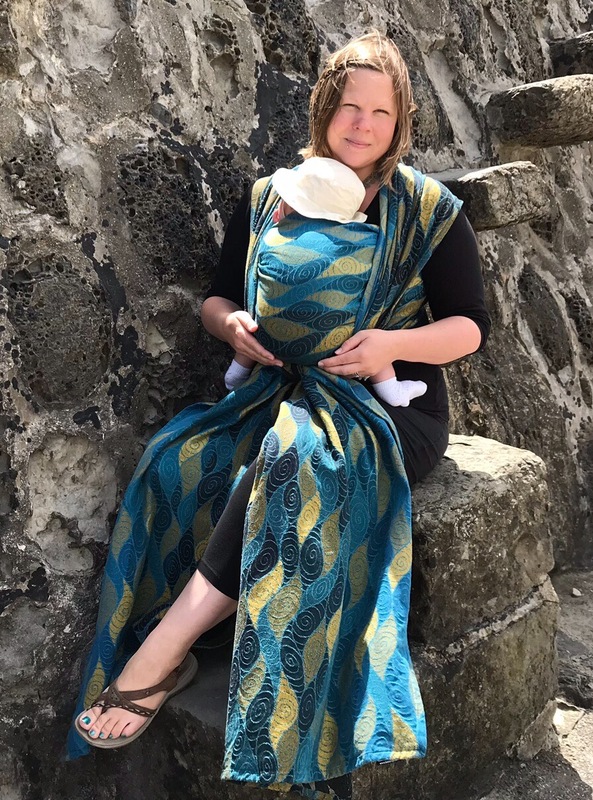 It was lovely and comfortable with my four month old, and I'd happily use it with a newborn. There's often a trade off between mouldability and support, but Seabed is a real birth to preschool wrap. It made easy work of lugging a chilly, sandy, wet toddler back up the long hill to the car, and was surprisingly comfy on my shoulders given its medium weight. Seabed is very easy care and can be put in the washing machine and tumble drier and steam ironed. It's also pretty hard wearing. This beauty put in a very hard day's work on the beach and didn't have a single pull to show for it. Seabed is a stunning, supportive, beautifully mouldable wrap that works well for tiny babies and big toddlers alike. Distinctly different from Baie's other weaves, the Double Weave combines mouldability and cush similar to that found in their Plush Weave with the support of their Snug Weave, and throws in a pinch of magical stretch and a dollop of aesthetic flair on top. Oh, and be prepared to be noticed with this one. 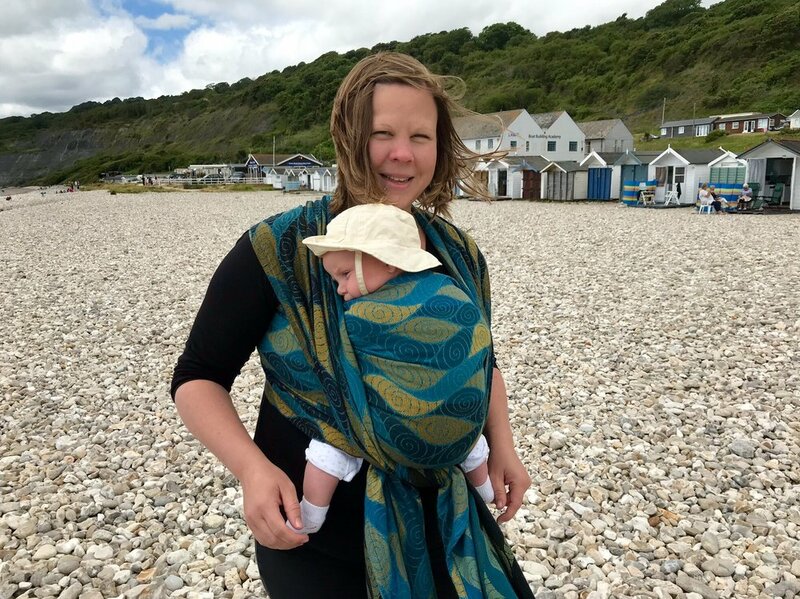 I had half of Lyme Regis complementing me on my beautiful "baby thing"! Element Seabed is available to buy now from the Baie Slings website.